Richwood Mild Filtered Cigars, offers high-quality blends of Kentucky Burley premium tobaccos packed inside a homogenized tobacco leaf wrapper. Measured at 3 ⅞ inches in length, ring gauge of 20. 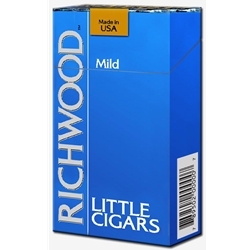 Richwood Mild Filtered Cigars are available in Box 100's and packaged 20 cigars per pack, 10 packs to a carton for a total of 200 premium filtered cigars. One of Smokers Discounts most popular and bestselling brand! Richwood Filtered Cigars are a smoker's true smooth smoke that enlightens with an edge of an all-natural tobacco delight. Whether you smoke at leisure or on break, your lips won’t regret coming in contact with the legendary Richwood Filtered Cigar. Call Smokers Discounts and start enjoying one today!